I loved that as a one-woman show, the actress spoke to an imaginary mother offstage, instead of directly addressing the audience. It created another character, and a kind of comic foil. I also loved how the actress continually got dressed and ready to go out. It worked both to reinforce the idea that she was never satisfied with her appearance, and it also set the stage for her retelling of past dates. Very clever. I love the dramatic moment that came at the very end. I wanted a few more of these surprises sprinkled throughout the performance to enhance the visual interest of the play. Perfection is an impossibility. It’s an ideal to be pursued. 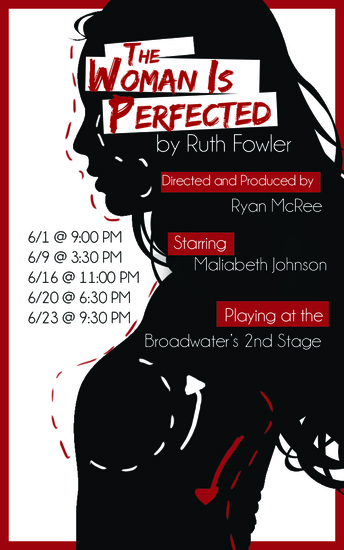 This play explores the dramatic ends we reach when we become obsessed with that which can not last. The audience is placed in the headspace of a woman in her late 20s who is struggling with her identity while going to increasingly drastic ends to stave off her physical decline. Viewers come away with a renewed understanding and empathy, not only for those suffering with body dysmorphia, but also for anyone searching for a way to feel validation in a world increasingly preoccupied with the superficial.